My name is Robert Redfern and I make it my job to publicize studies that prove poisonous drugs are not the best way to health and there are many natural health remedies that can cure the problem, but still do no harm. One such remedy is Curcumin. This is the first of a series of newsletters that will explore the many uses of this amazing solution to a wide range of health problems. “In fact, let’s put it this way: we have not found a single cancer on which Curcumin doesn’t work,” Aggarwal asserted. 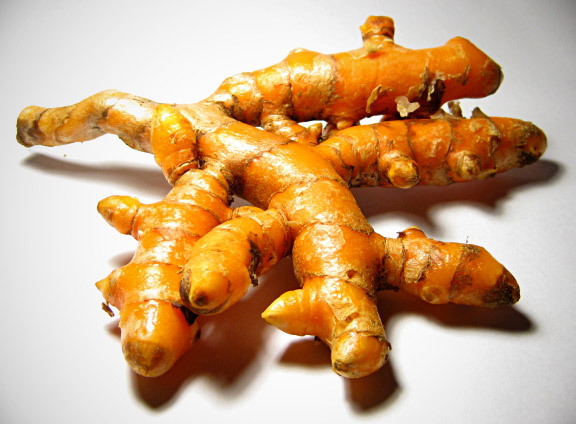 Turmeric, whose vernacular name is haldi, is a rhizome of the plant Curcuma longa. The medicinal use of this plant has been documented in Ayurveda, a 5,000-year-old system of medicine that has its origins in India. Turmeric has long been used as a food preservative, a colouring agent, a spice to flavour food and as a folk medicine to cleanse the body. “Because of turmeric’s extensive use in foods in India and Pakistan, the incidence of cancer, especially breast, colon, prostate and lung, is a lot less in those countries”, Aggarwal said. “And because South Indians use turmeric more widely than North Indians, the prevalence of cancer is less among them than among North Indians,” he said. “The spice has been shown to relieve arthritis as well”, he added. The U.T. team’s research focused on how Curcumin stops laboratory strains of melanoma from proliferating, and pushes the cancer cells to commit suicide. The team homed in on a molecule called NF-kappa B, a powerful protein known to promote an abnormal inflammatory response that leads to cancer in some people, arthritis in others, and a wide range of other diseases in other people. Two to five percent of turmeric is Curcumin and researchers have now found that Curcumin at 95% concentration is far more potent than plain old Turmeric. Aggarwal said that Indians have known all along about the anti-inflammatory benefits of turmeric, but “there was no documented proof” up until now. Dozens of clinical trials have already begun in the U.S., India, Israel and the U.K., to see if Curcumin also has the same effect on people as it has in the laboratory experiences. The UT findings will be published in the Aug. 15 issue of the journal, Cancer. Curcumin is a standardized extract of Curcuma Longa root. The active ingredients in Curcuma Longa are a group of plant substances called curcuminoids. Known collectively as “curcumin,” curcuminoids have demonstrated potent antioxidant properties in scientific studies.In better formulas, Curcumin is combined with the plant extracts to improve its absorption. Curcuminoids are responsible for turmeric’s distinctive yellow colour, but there can be less than 4% content in turmeric. Advanced Curcumin complexes usually supply 95% total curcuminoids and PC is added as a natural bio-enhancer, to promote absorption of the Curcumin. Native to Southeast Asia, Curcuma longa is a tall tropical shrub. The genus “Curcuma” belongs to the Zingiberaceae family, which includes ginger. The plant possesses a large root structure with fleshy, bulbous underground parts called “rhizomes.” These rhizomes, known as turmeric root, are harvested at maturity, dried and cured for commercial use. Turmeric is named in ancient Ayurvedic and Chinese herbal texts as a traditional folk remedy. Historically, turmeric was used externally for wounds, and sprains, and internally for digestive complaints, rheumatism, liver disorders, coughs and colds. Plant extracts known as phytosomes have been added to the curcumin extract in a patented formula known as Meriva®, created by Indena, S.p.A, who are worldwide experts in botanical extract technology. The addition of Meriva®, i.e. phytosomes bound to phosphatidylcholine (PC), means that curcumin is more easily absorbed by the body and better able to reach the cells that need it. In a 2007 study published in the journal Cancer Chemotherapy and Pharmacology, Meriva’s superior bioavailability was documented and found to be absorbed into the liver in higher amounts than ordinary curcumin. While a human study found curcumin’s bioavailability was 29x greater with Meriva than with curcumin alone. All round herb for general well being. Curcumin is the main biologically active part of Turmeric. Over 500 references to articles on Turmeric and Curcumin have been published in peer reviewed professional journals. If that is not enough, Turmeric has been used for thousands of years by Indian women to make their skin beautiful and blemish free. The numerous beneficial effects attributed to turmeric are probably due to the antioxidant properties of Curcumin. Antioxidants neutralize free radicals, which are highly unstable molecules that can damage cellular structures through abnormal oxidative reactions. Curcumin is a potent “scavenger” of the superoxide radical, a free radical that initiates potentially harmful oxidative processes such as lipid peroxidation. Through this activity, curcumin has been shown to protect skin cells from the injurious effect of nitro blue tetrazolium, a toxin that generates superoxide radicals. Curcumin also increases survival of cells exposed in vitro to the enzyme hypoxanthine/xanthine oxidase, which stimulates superoxide and hydrogen peroxide production, possibly by stimulating the enzyme catalyse. Curcumin itself is not toxic to cells, even at high concentrations. Because free radicals are involved in aging and exert harmful effects on skin, these results suggest curcumin may help slow skin aging. Curcumin demonstrates several other in vitro effects linked to free radical scavenging. Curcumin scavenges nitric oxide, a compound that when in excess is associated with the body’s inflammatory response. Pure curcumin and turmeric extracts protect red blood cells from lipid peroxidation induced by hydrogen peroxide. Curcumin has been shown to protect DNA from oxidative damage, inhibit binding of toxic metabolites to DNA, and reduce DNA mutations in the Ames test. Curcumin also demonstrates in vitro inhibition of COX-I and COX-II enzymes, which are involved in the inflammatory reaction. Together these results strongly suggest that curcumin has a potent bio-protective effect, with a potentially wide range of therapeutic applications. Curcumin is poorly absorbed in the intestinal tract, limiting its therapeutic effectiveness. Oral doses are largely excreted in faeces, and only trace amounts appear in the blood. By administering the Curcumin Phytosome which is 500mg of Curcuma longa extract with Phosphatidylcholine complex, this increases the bioavailability of curcumin by 100%. No side effects have been found when taking high doses of Curcumin. Rare cases of stomach upset or diarrhoea may be resolved by temporarily reducing the dosage and taking with food. Hi, I just had a question. Can curcumin be absorbed by plants and will it work as an antioxidant on this? Whatvis the best brand to buy for this combination in what dosage? Or am I better off growing my own? We recommend Curcuminx4000 for superior bioavailability and absorption.